With an increase of nearly a quarter of British holidaymakers choosing UK destinations over foreign shores this summer, Go North East’s Hadrian’s Wall Country Bus, the AD122, is already proving popular with 2017 tourists, enjoying nearly double the passenger numbers compared to 2016. After relaunching the seasonal route for 2017 on 14th April, Go North East welcomed over 1000 passengers in its first 10 days of service over the Easter period. Almost 50% more than during the same period last year, AD122 provides an inclusive transport to some of the country’s most breath-taking landscapes. Running daily until 1st October 2017, AD122 makes it easy to explore the region’s Roman heritage and visit the many historical sites along Hadrian’s Wall. Locations include Roman Vindolanda, a stunning excavated fort and civilian settlement, its museum housing the world famous Vindolanda Writing Tablets and Chesters Roman Fort, boasting one of the best preserved Roman bathhouses you can see in Britain today. Stephen King, head of commercial and retail at Go North East commented: “AD122 has always been a popular travel option for tourists wanting to explore Hadrian’s Wall country hassle-free. This Easter, we’re pleased to see the North East followed national predictions that 2017 is going to be the year of the ‘staycation’. With a reported 76% of Brits planning to holiday in the UK this year and passengers’ numbers up 50% on the route – we expect a bumper summer. The region’s largest bus operator recently took home the Inclusive Tourism accolade at the North East Tourism Awards, in recognition for its exemplary transport services and key role in welcoming both national and international visitors into the region. Its commitment to excellence in accessibility incorporates its easy access guarantee, comprehensive disability awareness driver training and partnership-led initiatives, encompassing conditions such as dementia and sight problems. 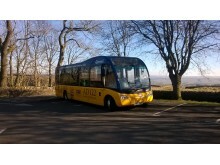 The AD122 services runs hourly between Hexham Bus Station and Haltwhistle Rail Station via Hexham Rail Station, Acomb, Wall, Chollerford, Chesters Roman Fort, Housesteads Roman Fort, Vindolanda, Milecastle Inn, Roman Army Museum, Walltown and Greenhead. 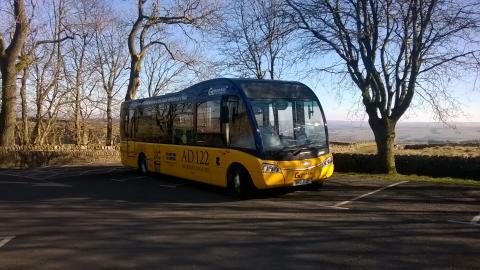 Passengers can also enjoy great discounts with their AD122 ticket including saving 10% on admission to Vindolanda,Roman Army Museum, Housesteads and Chesters.